Time after time, the students in my cooking classes in Paris or Provence tell me “I don’t bake.” These same students are often delighted when I assign them a dessert, for they know that they will at least learn to make one wonderful sweet. I think that they also secretly hope that by week’s end, they may actually get over their fear of baking. When it comes to cooking, my philosophy is to keep it simple and make sure it’s delicious. One foolproof recipe in my repertory is for chestnut honey squares, a confection that satisfies in a single bite. It can be made ahead, does not require exotic equipment, is relatively simple (you pat the crust in the pan) and it’s beautiful, with a glistening glaze. Stored in an airtight container, it stays fresh for days. The inspiration came from the Paris bakery Moulin de la Vierge. I was sampling a wide selection of sweets, and as I bit into the honey-kissed square, I stopped, almost stunned at how special it was, something you could eat out of hand with a bit of crunch and only a hint of sweetness. The crust is butter-rich but not too much so, an easy blending of flour, almond meal, unrefined sugar, butter, an egg yolk, vanilla extract and a touch of fine sea salt to brighten the flavors. A quick pulse in the food processor with a bit of water, and the pastry is ready to pat in the pan and bake. We all think our ovens are sometimes temperamental; I love that this crust will turn out just fine at a range of temperatures. I find that most home cooks tend to underbake, especially pastry, so I instruct my students to make sure the pastry is golden and crisp, not pale and limp. I don’t even mind if it is really, really dark. As my friend Eli Zabar likes to say, “Burnt is best!” I might not go that far, but it must be fully baked. The topping comes together in minutes while the pastry bakes. Sweetened with just 2 tablespoons of intensely flavored honey, like chestnut honey, it is a simple blend of butter, sliced almonds, cubed candied orange or lemon peel, and vanilla extract, just melted in a saucepan over low heat. The darker honey is crucial; you can find it online if not in a specialty store. Once the pastry is golden, spread on the topping, bake until deep golden, remove from the oven and let cool. I cut it into tiny squares (32 is a good number) to produce a bite-size dessert. I am thinking of creating a variation with the flavorful organic Sicilian pistachios I find at my local co-op, toasting the nuts, grinding some to a powder and chopping the rest for the topping. I’ll make it with the organic lavender honey from our farm in Provence. It will glow, and I’ll pat myself on the back. I share this recipe from my latest book, The French Kitchen Cookbook: Recipes and Lessons from Paris and Provence. Heat oven to 400 degrees. Line a 9 1/2-inch-square baking pan with parchment, letting it hang over the sides for easier removal later. Prepare the pastry: In a food processor, combine flour, almond meal, sugar and salt. Pulse to blend. 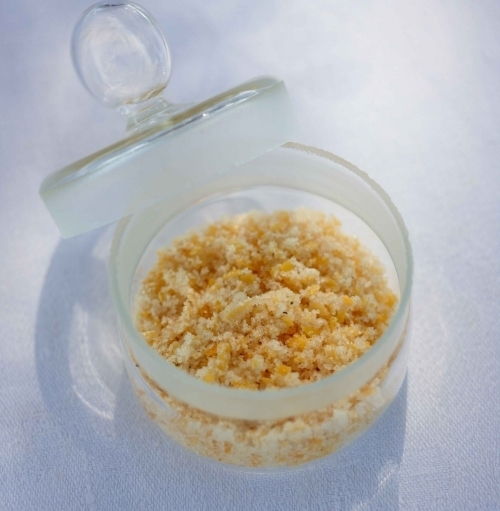 Add the butter and pulse until the mixture resembles coarse crumbs. Add egg yolk, vanilla and 1 tablespoon of water. Pulse to incorporate. Add 2 to 3 tablespoons of water through the feed tube, tablespoon by tablespoon, pulsing until just before the pastry forms a ball. You may not need all the water. Turn the dough out into the prepared baking pan. Press the dough evenly into the bottom of the pan. Place in the oven on the center rack and bake until the pastry begins to brown around the edges, 12 to 15 minutes. While the pastry is baking, prepare the topping: In a saucepan, melt the butter over low heat. Add the almonds, candied peel, sugar, honey and vanilla extract. Heat just until the ingredients are incorporated. Remove the pan and spread the almond-honey mixture evenly over the pastry. Return the pan to the oven and bake until the topping is a deep gold, 12 to 15 minutes. Remove and transfer to a rack to cool in the pan. Once it has cooled, remove from the pan and cut into 32 squares. Store in an airtight container at room temperature for up to 3 days. NOTE: Whole, unblanched almonds can be finely ground in a food processor to make almond meal. To make vanilla sugar, cut 1 or several vanilla beans in half lengthwise, scrape out the seeds and reserve for another use. Dry vanilla bean halves at room temperature and place in a large jar of sugar. Store for several weeks to scent and flavor the sugar. Golden brown, with a firm and crusty exterior, a smooth and creamy interior, these oh-so-easy potatoes have become a staple at our table. The potatoes were part of a vegetable medley at a recent lunch with our cooking school students at Johannes Sailer’s Les Abeilles in the Provencal village of Sablet. I like to roast the potatoes on a bed of freshly harvested rosemary. Center a rack in the oven. Preheat the oven to 425°F (220°C). In a large skillet, heat 3 tablespoons of the poultry fat or oil over moderate heat until hot but not smoking. Add the potatoes and sear on all sides until a deep golden and well-crusted, about 15 minutes total, adding additional fat if the pan becomes too dry. Season lightly with salt. Place a bed of rosemary in a roasting pan. Add the seared potatoes and roast until they can easily be pierced with a fork, 25 to 30 minutes. Season to taste and serve warm. Le Bistrot du Paradou secret revealed! For nearly 30 years I have made regular pilgrimages to Le Bistrot du Paradou, where Mireille and Jean-Louis Pons held court, offering us incomparable local Provençal fare, from lamb to rabbit, garlicky aioli and tender roast chicken. Vegetable dishes are honored here, including golden slices of eggplant, always offset by this thick and shimmering tomates concassées, a thick tomato accompaniment glistening with the local oil from the cooperative in Maussane-les-Alpilles, studded with cubes of ruby tomatoes, bits of onion and fresh leaves of basil. Years ago I asked Mireille for the recipe, and she offered that off season she used canned tomatoes and in season usually a blend of fresh and canned. I spent endless hours attempting to recreate the sauce, never achieving any of the elegance of Mireille’s triumph. Mireille and Jean-Louis are no longer a presence in this always lively bistrot, but on my last visit longtime chef Vincent revealed the simplicity of the recipe: Canned diced tomatoes cooked long and slow, embellished with nothing more than the best olive oil, a touch of salt, onions, and basil. Success at last! The aroma that fills the kitchen as the fragrant olive oil hits the warm, thick sauce is worth the effort all on its own. In our house, a favorite use is as a topping for freshly toasted homemade multigrain sourdough bread. 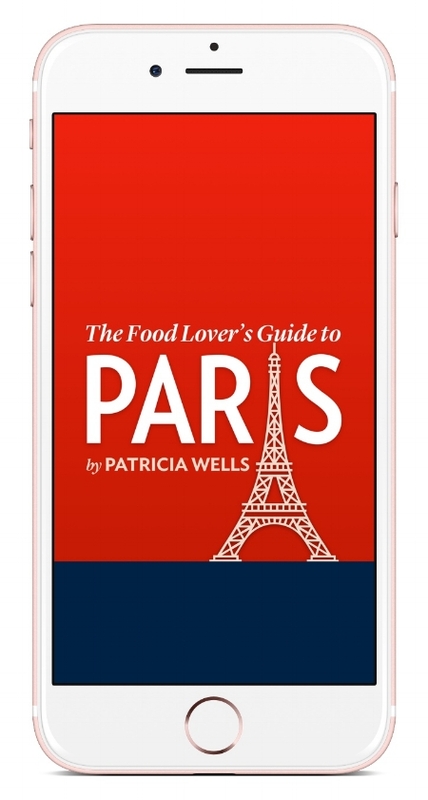 In researching The Food Lover’s Guide to Paris application for the iPhone, I kept returning again and again to baker Gontran Cherrier’s breads and pastries, all stand-outs, all delicious. This chocolat tart is totally decadent and totally delicious. A very slim wedge is truly satisfying. Equipment: A 9-inch (23 cm) tart pan with a removable bottom. Center a rack in the oven. Preheat the oven to 375 degrees F (190 degrees C). Arrange the pastry in the tart pan, trimming the edges so that the pastry neatly fits the pan. In a saucepan, combine the butter and brown sugar over low heat just until melted. Stir to blend. Stir in the salt, honey, and maple syrup. Spread the mixture over the bottom of the prepared pastry. Sprinkle with the nuts, and the dried and candied fruit. Place in the center of the oven and bake the crust is dark golden and the topping is bubbly, 15 to 20 minutes. Let cool for 25 minutes. Meanwhile, prepare the ganache topping. In a saucepan, heat the cream over moderate heat. Add the chocolate and stir to melt the chocolate. Stir to blend. Spread the ganache over the top of the tart. Refrigerate for 3 hours before serving, cutting into very thin wedges. Note: In France we use Marie’s all-butter puff pastry. In the United States, we favor Dufour brand frozen puff pastry, available at most Whole Foods grocery stores. Mushrooms amaze me. They give so much for so little. One of the least expensive vegetables to be found in the market year-round, the common button mushroom is a treasure of flavor, texture, aroma. 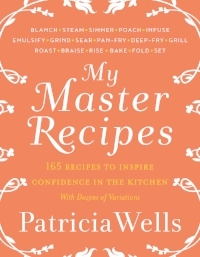 There is a story behind each recipe. This one has several. The last day of our last Provence class one September, I sent a student to the vegetable garden for salads and herbs. She came back screaming “Your garden has been destroyed, everything is in disarray.” Sure enough. Big chunks had been chewed from the pumpkins. Zucchini plants had been pulled out, salads trampled, there were crater-like holes everywhere. The wild boar had had a midnight party. I didn’t cry because we were leaving the next day and wouldn’t be back for several months. But I laughed when I saw that they had not touched the arugula or the shiso! No gourmets, those boars. Fast foreward to Christmas: A neighbor who is a veteran hunter arrived at the door with a huge package of frozen wild boar, promising me that this was not the animal who had destroyed my garden. (How could he be sure?) I thought about re-gifting the creature but decided cooking it myself might be the best revenge. The daube was delicious. Back in Paris, I decided to re-test the recipe with beef, and when I went to my local butcher and simply asked for 2 kg of beef for a daube, preferably two or three different cuts, he created a veritable still life. I arrived home with three cuts of beef, strips of caul fat, marrow bones and of course a garnish of fresh parsley! While the daube can be prepared with a single cut of meat, I like to use two or three, to allow for more complex flavors and textures. Careful searing of the meat is essential, to seal in juices. Flaming the wine adds another layer of flavor. A few marrow bones and strips of caul fat add a fabulous, silken texture to the final product. And while most French daube recipes recommend using either fresh tagliatelle or dried penne pasta, I prefer sheets of fresh pasta. They’re prettier on the plate, easier to eat, and more quickly absorb the silken sauce. Equipment: A heavy-duty casserole with a lid; a 10-quart (10 l) pasta pot, fitted with a colander; 8 warmed, shallow soup bowls. In the casserole, heat the oil over moderately high heat until hot but not smoking. Add several pieces of the meat and brown them over moderate heat, regulating the heat to avoid scorching the meat. Do not crowd the pan and be patient: Good browning is essential for the meat to retain flavor and moistness. Thoroughly brown the meat on all sides in several batches, about 10 minutes per batch. As each batch is browned, use tongs (to avoid piercing the meat) to transfer the beef to a platter. Immediately season generously with salt and pepper. Return all the meat to the casserole. Add the wine and bring to a simmer. Flame the wine to burn off the alcohol. Be very careful here: Be sure nothing flammable is near the burner. It will take about 4 minutes to burn off the alcohol. Add the stock, onions, carrots, bay leaves, and tomato paste. If using, add the caul fat and marrow bones. Cover and bring just to a simmer over moderate heat. Cook, covered, maintaining a very gentle simmer, until the meat is very tender, 3 to 4 hours. Stir from time to time to evenly coat the pieces of meat with the liquid. The sauce should be glossy and thick. Taste for seasoning. (The daube can be prepared a day in advance, covered and refrigerated.) Reheat at serving time. Prepare the mushrooms: In a large, covered saucepan, combine the butter, mushrooms, and lemon juice. Cover and cook over moderate heat until tender, about 5 minutes. Keep the mushrooms warm while finishing the dish. Prepare the pancetta: In a large skillet with no added fat, brown the pancetta over moderate heat until crisp and golden, about 5 minutes. With a slotted spoon, transfer the pancetta to several layers of paper towel to absorb the fat. Blot the top of the pancetta with several layers of paper towel to absorb any additional fat. Fill the pasta pot with 8 quarts (8 l) of water and bring to a rolling boil over high heat. Add the coarse salt and the pasta, stirring to prevent the pasta from sticking. Cook until tender. Drain. Transfer a square of pasta to each warmed shallow soup bowl. Arrange several pieces of meat, the carrots, mushrooms and bacon on top of the pasta. Garnish with parsley. Serve. Note: Use two to three different cuts of beef here, choosing from the top or bottom round, heel of round, shoulder arm or shoulder blade, neck, or short ribs of beef. Wine suggestion: I love an elegant Syrah here, such as Domaine Vincent Paris’s ruby Cornas. While preparing a cooking demonstration for the Google staff in San Francisco, the chef presented me with the most delicious homemade pistachio oil. He said he couldn’t readily find what I had requested, so prepared a batch himself! That put me in a creative mood, and now when the proper nut oil is not readily at hand, I make my own. Here’s a version I created using top-quality almonds. I use the oil to embellish all manner of foods, from braised asparagus to these toasted, herb-infused almonds. Equipment: A small, nonstick skillet; an electric spice mill; a baking sheet. Center a rack in the oven. Preheat the oven to 350 degrees F.
. Prepare the almond oil: In the skillet, toast 1/2 cup of the almonds over moderate heat until toasty and fragrant, about 5 minutes. Toss from time to time to toast them evenly. Remove to a plate to cool. Once cooled, transfer the nuts to the spice mill and grind coarsely, to about the size of a small grain of rice. In a small saucepan, warm the oil. Off the heat, add the ground almonds and stir to blend. Set aside for at least 1 hour to infuse the oil. Transfer the oil and nuts to an airtight container and store in the refrigerator for up to 3 days. In a large bowl, combine the remaining 2 cups of almonds, 1 tablespoons almond oil (with the ground nuts), 1 tablespoon minced rosemary, the lemon zest and the salt. Toss to coat the nuts. Transfer to the baking sheet. Scatter with the whole sprigs of rosemary. Place the baking sheet in the oven and toast until fragrant and golden, about 5 minutes. Transfer to a bowl to cool. Once cooled, remove and discard the rosemary sprigs. (Store in an airtight container at room temperature for up to 2 weeks.) At serving time, garnish with fresh rosemary sprigs. I am always on the lookout for unusual appetizers and this one brings back memories of travels to Vietnam, where kaffir lime and all varieties of nuts -- especially peanuts -- appear freely and frequently. Kaffir lime trees grow easily, so if you live in a temperate climate, add one to your garden or patio. Fresh, frozen, and dried leaves can be found at Asian food shops. Fresh leaves, of course, are the most intensely flavored. Arrange a rack in the center of the oven. Preheat the oven to 350 degrees F (180 degrees C). Combine the nuts on a baking sheet. Spray lightly with oil and toss to coat. Place the baking sheet in the oven and lightly toast the nuts, about 5 minutes. Transfer the nuts to a bowl, and while still warm, add the kaffir lime powder and rice crackers and toss to blend. Taste for seasoning. Serve. I just returned from a week-long professional course on sous-vide, a method of cooking vaccum-packed foods at very low temperatures to capture maximum flavor, texture, even color from an ingredient. And I’ll never be the same in the kitchen. Sous vide has been around for more than 30 years (when I worked with chef Joel Robuchon at Jamin in the early 1980’s, he was already experimenting with the process) but is only beginning to catch on for the home cook. During the course, given at CREA (Centre de Recherche et d’Etudes pour l'Alimentation) in Paris’s 14th arrondissement, we cooked salmon and cod, beef and lamb, kidneys and sweetbreads, pork roast, chicken breasts and thighs, duck breasts and foie gras, lobster and scallops, even an entire turkey in honor of Thanksgiving (see photo) Every vegetable imagineable – green beans, potatoes, carrots, artichokes, fennel, asparagus – was subjected to our experiments. We even did tests with fruits, ranging from apples to pinapple to watermelon. Sous vide (French for “under vacuum”) or cooking food at low temperature in a water bath, is practiced by a number of chefs world wide, including Robuchon, Thomas Keller, Ferran Adriá, Michel Richard, and Heston Blumenthal. Our CREA professor Bruno Goussault trained them all, so we knew that we were in good hands. What I learned is that sous vide is NOT a replacement for traditional cooking methods – steaming, braising, searing roasting -- but an additional way to cook. Not every food improves with sous vide cooking but many ingredients do. Because ingredients are cooked to a perfect “core” temperature, meat and poultry remain perfectly ,evenly cooked throughout, with a texture that is unachievable in traditional cooking methods. Flavors that would normally evaporate into your kitchen, are preserved in that plastic bag. Artichokes cook without oxidyzing; a chicken breast comes out perfectly, evenly cooked, the same moist and appealing uniform texture throughout. I also learned that many items – particulary green beans and most green vegetable – are not suited to sous vide cooking for there is no way to maintain their brilliant green color. I also learned that this is not a process that is about convenience but rather precision, resulting in flavors that are more pure, more intense. In future blogs I will go offer specific recipes and suggest how to purchase essential equipment (thermometers, water baths, and vacuum sealers) but for now I want to pass along a fabulous cooking tip that does not involve the sous vide process. A preferred method for cooking fish is steaming. I like to steam fish on a bed of fragrant herbs --- rosemary, dill, thyme, or mint –all of which infuse the fish with their heady perfume. Garnish the fish with more minced fresh herbs, a drizzle of almond or pistachio oil, and a few brine-cured black olives. Soaking the salmon in brine blocks the albumin, or white substance that rises to the surface of the fish. Equipment: A tweezers; a steamer; 4 warmed dinner plates. Run your fingers over the top of the salmon fillet to detect any tiny bones that remain in the salmon. With a tweezers, remove and discard the bones. Cut the salmon into four even, 8-ounce portions. In a large bowl, combine the salt and 1 quart of water and stir to dissolve the salt. Immerse the fish in the brine and set aside at room temperature for 10 minutes. Bring 1 quart of water to a simmer in the bottom of the steamer. Place the herbs on the steaming rack. Place the fish on top of the herbs. Place the rack over simmering water, cover, and steam just until the fish is cooked through, about 6 minutes. I have never entered a recipe contest in my life, but when I saw that Neff would be giving away an oven I have had my eye on for awhile, I thought I'd try. The oven is a dream, with a door that slides down inside the oven so it's not in the way, a low temperature setting for long slow roasting, special settings for bread and pizza, as well as an option for turning it into a steam oven! So I am entering one of my favorite desserts (and one that always gets raves from my students), the Verona Almond and Polenta Cake. With almonds, polenta, lots of butter, flour, and a single egg, the mixture ends up much like dough a cookie dough, which is then dropped by little handfuls onto a parchment paper lined baking sheet. When served, the entire "cake" is brought to the table and guests simply break off a piece for pleasant feasting. If anyone wants to enter the Neff contest, visit neff-electromenager.com. Recipes must be sent by December 31. The oven of course is 220 and the site is in French. I'll let you all know if I win! It means a lot to say that this will be one of the most delicious tastes and textures you will put in your mouth in a lifetime. I first sampled this sandy cookie/cake/snack/dessert in a lovely Italian country restaurant near Verona – Osteria Valpollicella – one Saturday in March. This cake came as a surprising close to a splendidly modern lunch that included a pristine white ball of homemade cheese set atop the region’s spicy mostarda; paper-thin slices of home-cured beef; a stunning risotto laced with wild herbs and greens from the mountains; and a slab of local cheese teamed up with a mound of wilted wild greens and a crisp slice of grilled bacon. The recipe for this local specialty comes from Rosetta Gasparini, a fine cook who is part of the kitchen team at Villa Giona, owned by the Allegrini wine family. If you go into the town of Mantua, you will hardly find a shop window that does not display this buttery, crumbly, irresistible cake. Traditionally, it is sampled with sweet local wines such as Recioto. Sbrisolona is a rustic dessert, baked as a slab on a baking sheet and set on the table as one whole piece. Guests break off an end and enjoy with a sip of sweet wine. I use salted butter for this cake, for I find it brightens the flavors. Equipment: A food processor; a baking sheet lined with baking parchment. 3. In the bowl of a food processor, coarsely chop the almonds. 4. In a bowl, combine the chopped almonds, flour and polenta. Toss to blend. 5. In another bowl combine the melted butter, sugar, egg, and almond extract, and stir to blend. Add the dry ingredients to the liquid ingredients and stir to combine until the mixture is homogeneous. The texture should be like that of cookie dough. 6. Drop the mixture onto the baking sheet in handfuls, rubbing the dough between your fingers to make its characteristic uneven surface. Scatter the reserved whole almonds on top of the dough. 7. Place in the center of the oven and bake until deep golden and crisp, 20 to 30 minutes. MAKE SURE THAT THE CAKE IS GOLDEN AND CRISP! THAT’S THE WHOLE POINT. Let cool before serving. The crumbly almond cake is not cut with a knife but simply broken into pieces by hitting with your fist o breaking with your fingers. It is ideally matched with a sweet red wine, such as Recioto, but can also be served with a generous sprinkle of grappa. The cake keeps well, and can be stored in an airtight container for up to one week. Hello from my annual "boot camp" week at Rancho La Puerta in Tecate, Mexico. That's our group at 7 am this morning on a misty 7-mile mountain hike. I'll be sending notes and recipes from one of my favorite places in the world. No Côtes du Rhône, but plenty else! 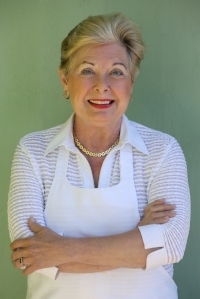 Here's a recipe inspired by the delicious, wholesome food at the Ranch, and one that's included in my upcoming book Salad As A Meal, to be published next spring. These ultra-thin egg crepes make a perfect lunch, accompanied by a simple green salad. The egg is simply a light envelope for whatever you want to put inside: Here I suggest mushrooms and spinach, but one could also dig into the pantry or refrigerator for all manner of herbs, vegetables, and cheese on hand. Equipment: A 10-inch nonstick crepe pan. 1. In a 10-inch nonstick skillet heat 1 teaspoon of oil over moderate heat. Add the mushrooms, season lightly with salt, and cook just until soft, 3 to 4 minutes. With a slotted spoon, transfer the mushrooms to a platter to drain. Add the spinach to the skillet with 2 tablespoons of water. Cover and cook until wilted, 1 to 2 minutes. Drain the spinach, chop, and season with salt and freshly grated nutmeg. 2. Crack each egg into a small bowl. The egg should be lightly beaten with a fork (not a whisk) just enough to combine the yolk and the white well without incorporating air bubbles that might make the crepe dry out. Add 1 tablespoon of water to each bowl. 3. Warm the crepe pan for a few seconds over high heat. Add 1/2 teaspoon of oil and swirl to evenly coat the pan. Add the egg, tilting the pan from side to side to evenly coat the bottom of the pan. Cook just until the egg is evenly set but still slightly liquid on top, about 1 minute. Remove the pan from the heat. Quickly spoon half the spinach, then half the mushrooms, herbs and cheese in the center of the egg crepe to form a strip parallel to the pan. With a fork, carefully fold the crepe over the filling from each side. Tip the pan up against the edge of a warmed plate so that the crepe rolls out browned side up. Season with salt and pepper. Repeat with remaining egg crepe. Serve immediately. Variations: Wilted Swiss chard and feta; wilted lamb’s lettuce and ricotta; salsa, cubed avocado and grated cheese; morels in truffle cream with chives. Wine suggestion: Our winemaker Yves Gras makes one of the “best drying whites of the Southern Rhône,” or so says wine expert Robert Parker. We agree, for his Sablet Blanc Le Fournas is crisp, chalky, elegant and made for everyday drinking. Perfect with this simple but sublime egg crepe. I went a little crazy this year and ended up with 82 tomato plants. They are just beginning to come in now, and I believe that one NEVER has too many tomatoes. Should there be more than I can deal with, I quarter and freeze them, variety by variety, and cook them up later for multicolored sauces. Many of my plants did not make it this spring, with too much rain and not enough sun. But there will be plenty to see us through to October. Current high performers include my favorites: Green Zebra, the bright orange Valencia, Ida Gold and Coeur de Boeuf Orange, the yellow Jaune Saint Vincent and Banana Leg, the fabulous Ananas, Striped Germain and Tigerella, and the always productive Russe. A new and interesting heirloom is the white Beauté Blanche de Canada, a large tomato with ivory skin and pulp and mildly acidic flavor. I confess that I am nearly breathless with excitement when I can slice multicolored varieties and arrange them on a giant white platter, season them with my homemade Fennel and Saffron Salt and sit down to lunch, with a fat slice of my toasted homemade sourdough bread. I hope you enjoy the salt: saffron, fennel and tomatoes seem to love one another's company. Once you try this on a simple fresh tomato salad, you will be sold! Fennel, saffron and tomatoes make a perfect trio. Keep the salt on hand for anytime you want to add sunny flavors. I use the less expensive ground saffron here. Once the salt dissolves, the saffron bleeds a golden, reddish orange hue. Combine the ingredients in a spice grinder, grinding until the fennel seeds are very fine. Transfer to a small jar. Cover and shake to blend. Store securely covered to maintain freshness. The mixture will stay fresh for several months.